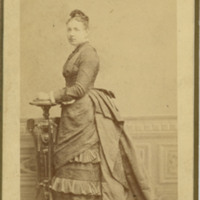 Photograph of Mary Garrett standing up with her hands resting on top of a small table. 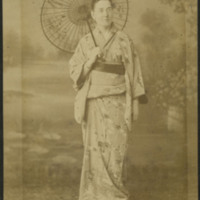 Photograph of Mary Garrett dressed as in traditional Japanese clothing. 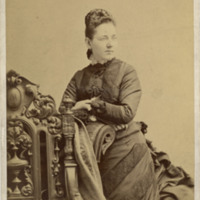 Photograph of Mary Garrett leaning against a chair and facing sidways away from the camera. 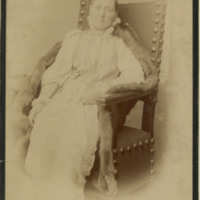 Photograph of Mary Garrett posing in a chair and facing the camera. 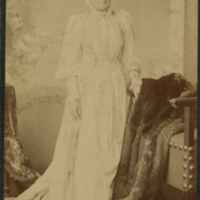 Photograph of Mary Garrett in Japan. 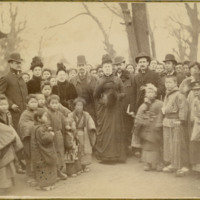 She is standing in the middle of a large crowd of people, including some adults and schoolchildren. 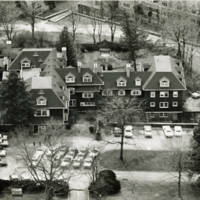 Photograph of Mary Garrett at the age of 35 when she built the Bryn Mawr School building. 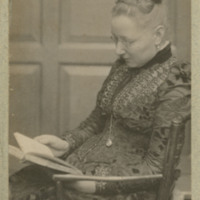 Photograph of Mary Garrett sitting in a chair and reading a book. 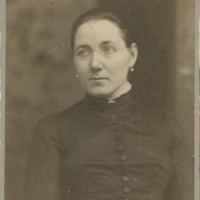 Photograph of Mary Garrett, facing the camera and wearing glasses with her hair tied back. Photograph of the home of T. Harrison Garrett, brother of Mary E. Garrett, in Baltimore. 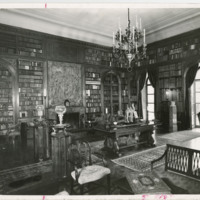 The photo is a panoramic view of the library with floors, rugs, tables, chairs and a large chandelier also visible.